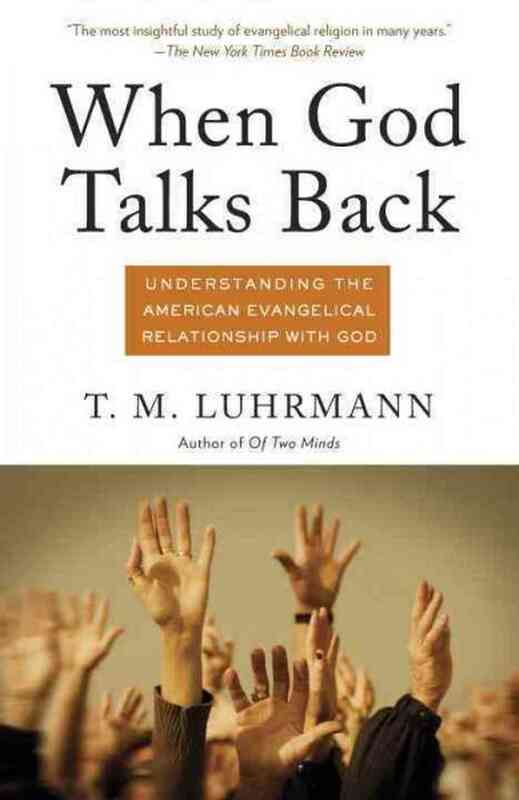 The subtitle of Tanya Luhrmann’s When God Talks Back describes the book as an attempt to understand “the American Evangelical Relationship with God”. Luhrmann’s focus on “relationship with God” means that she is not trying to understand evangelicalism as a social-political movement or theological system, but as a particular way of being in the world, a theory of mind. Luhrmann is particularly interested in that section of evangelicalism that takes seriously the claim that Christianity is “a relationship, not a religion”, people who are actually trying to cultivate a conversational relationship with a God who is inaccessible to the senses. What she gives us in the end is a phenomenology of Christian prayer. It is fitting that she immerses herself in the Vineyard Church, a group known for its focus on the Holy Spirit, tangible signs of God’s work, and above all, “intimacy with Jesus”. Though the Vineyard Church is more doctrinally charismatic than most evangelical churches, I felt as though she could have been writing about any number of the churches that I’ve worked with, in and around during the last 12 years as a pastor and retreat speaker: Baptist, Presbyterian, , Evangelical Free Filipino, Nondenominational Korean, to name just a few. Luhrmann argues that evangelical Christianity is an attempt to develop a theory of mind wherein people are trained “to experience a part of their mind as the presence of God” (xxi). This is not a statement of ontology but of phenomenology. If God is supernatural, she argues, then surely his overtures would come within the natural human processes: “if God speaks, God’s voice is heard through human minds constrained by their biology and shaped by their social community” (xxiv). The identification of God’s presence and voice amidst the whir of everyday life then sets the stage for a conversational relationship with God, which Luhrmann understands through the rubric imaginative play. This kind of prayer requires the cultivation of imaginative absorption. Here I wish that Luhrmann was a bit more explicit about what theory of imagination she was working with (the Platonic fanciful imagination is much different, than Coleridge’s generative imagination, or Merleau-Ponty’s bodily imagination) though I suspect that the tension was intentional. The bottom line here is that a person must learn to relate to God “as if” God were a being in this world. The goal of the relationship is ultimately therapeutic: to experience God’s unconditional love. Luhrmann’s work leaves me with many questions. She operates on the assumption that we are living in a disenchanted world, to use Charles Taylor’s term, an “immanent frame”. The self in modern times is private, buffered, no longer porous to unseen agencies as it was 500 years ago. I think she is right, and I wonder if the evangelicals in her story have found God outside of the immanent frame or within it. The answer to this has implications for how we conceive of the role of worship. Can we really rewire a social imaginary through worship? If so, how? Is our goal in worship to point people to a reality that exists on a different plane than their ordinary, immanent experience? Or is there a possibility of somehow alerting them to God’s presence within the immanent frame, within the ordinary? And if we can, will that apprehension resemble what Luhrmann describes in this book? Unquestionably, Luhrmann does not capture the whole story. Her focus is narrowly on “relationship with God” and thus fundamental markers of evangelicalism like conversion, theology, mission and historicity (“that which we have seen with our eyes and our hands have handled”) are ignored. Yet I believe that she has thrown her dart very near the center. The strength of Luhrmann’s work is its empathy and compassion; you get the sense that she really understands. If this is the case, it is because she has actually thrown herself headfirst into evangelical prayer practices and tried to learn how to pray. And yet, one wonders how it was possible for her to give herself wholly to prayer while also trying to analyze it as an anthropologist. As another reviewer put it (drawing from C.S. Lewis), it is “like looking through a window and at a window at the same time.” I read the book wanting to flip to the final page to see if she had a conversion experience; when I arrived I found that though she does not call herself a Christian, indeed something like a conversion seems to have taken place. This entry was posted in Books, Reviews by Justin. Bookmark the permalink.